Family oriented TV sensations’ the Robertson Family have brought many laughs and tender moments to the small screen, but they haven’t stopped there. Up next in their to-do list: a campaign that hits home in the hearts of their fans – Drive Adoption. More than 55,000 young adults become homeless each year, and more than 2 million already are. If that’s not a warning sign that something’s up, then we need to get glasses. Korie and Willie Robertson, two of the main stars and heads of the family on DD, have had a huge heart for adoption. They’ve already adopted one biracial child as a baby, took in a foster student from Taiwan, and are in the process of adopting a third child. They’ve sure got the ball rolling on making a difference – but they can’t do it alone. 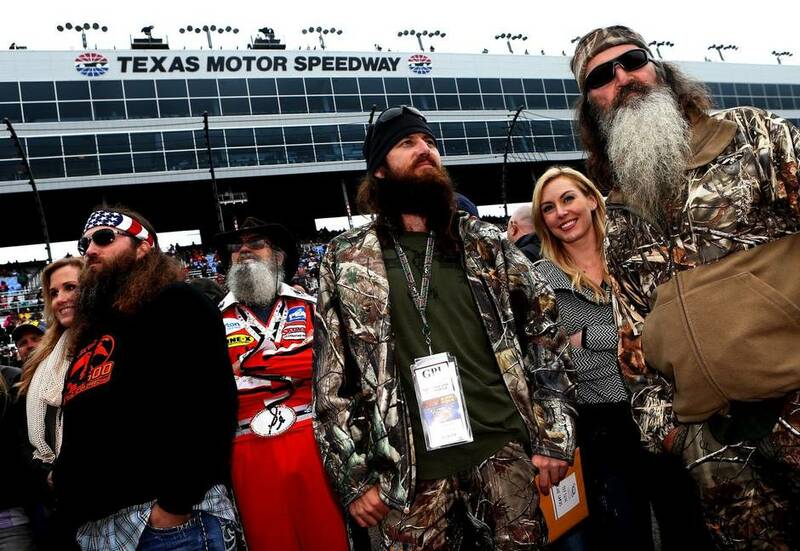 The Duck Commander team has been leading the Duck Commander 500 for the past two years. It is a NASCAR Sprint Cup Series stock car race held at Texas Motor Speedway in Fort Worth, Texas, and a great way to get people’s attention. Last year, while headlining the race, Korie and Willie met their third child they’re in the process of adopting, who’s been the inspiration for this great campaign. This is the 3rd and last year that the Duck Commander team owns the rights to the race, and Korie and Willie decided they wanted to make this year’s race something bigger than themselves. 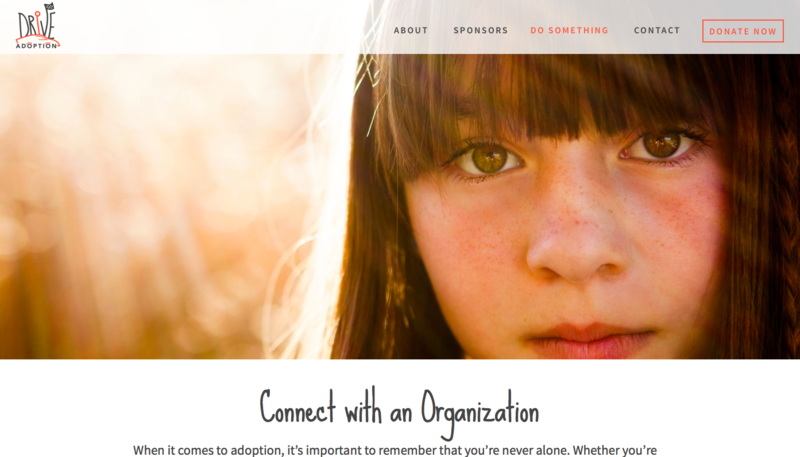 So, in honor of their third adopted child, the Drive Adoption campaign will aim to raise awareness for the need of adoption, and getting kids placed in good homes. “It is in honor of that special meeting and the thousands of children around the world who are still waiting to find a family to call their own that we have decided to dedicate this race to the cause of adoption,” Korie said. But every major campaign needs a base to work off of, and that’s where Freeform came in. Korie’s brother Ryan Howard, executive director of Drive Adoption, met with Freeform CEO Bryan Wilks and laid down the details. “We need a central location to work off of, somewhere to have home base”, said Howard. They needed a website that would serve as a building block for the campaign, and somewhere to direct everyone who’s interested from publicity and from the race to. But this couldn’t be just any old website. “Freeform had helped us more conceptualize what we were trying to do, especially in the social web atmosphere”, Howard said. So the Freeform team got together, and got to work. The goal: have Drive Adoption live through the website. Freeform brought comp websites, compared what was and wasn’t in line for the vision of Duck Commander and Drive Adoption, and got a perfect feel for the site’s outline. Working off of color kits and logos, Freeform built the completely custom website from the ground up. Freeform knew that when the viewer entered the site, they had to get the point fast. The average consumer attention span on a webpage lasts for about 10 seconds, and if they’re not completely convinced from the start, then sayonara. That’s why Freeform developed the site with the goal of consumer immersion. When the viewer stepped into the site, they would be engrossed in an atmosphere that lived and breathed not only adoption, but accessibility and understanding as well. Better yet, the website was built from the ground up – in less than a month. “We wanted the viewer to get hit with an emotional connection from the start, and Freeform made the site do more than that, they brought the viewer into the world of the campaign and adoption itself”, Howard said. The design process for the site was quintessential. Freeform knew that the campaign was for adoption, so they wanted to pull at the heart strings of every viewer, and get them to want more and to do something. A major goal of Freeform is to turn potential candidates into customers, and in this case, people interested into people informed and people donating. Through Freeform’s core of ideation, driveadoption.org can serve as a fully informative site, along with a place to donate and a solid campaign base for corporate sponsors to get their interests into. The site features a plethora of facts and stats on adoption, along with a fully interactive format with depth and life to it. It consists of informative sliders, warm and heart-touching imagers, and even an interactive Share Your Story API that allows anyone to post their adoption story in real time, which will prove to be popular during the race itself. It is even mobile friendly, with responsive design, frictionless interactions and informative content. 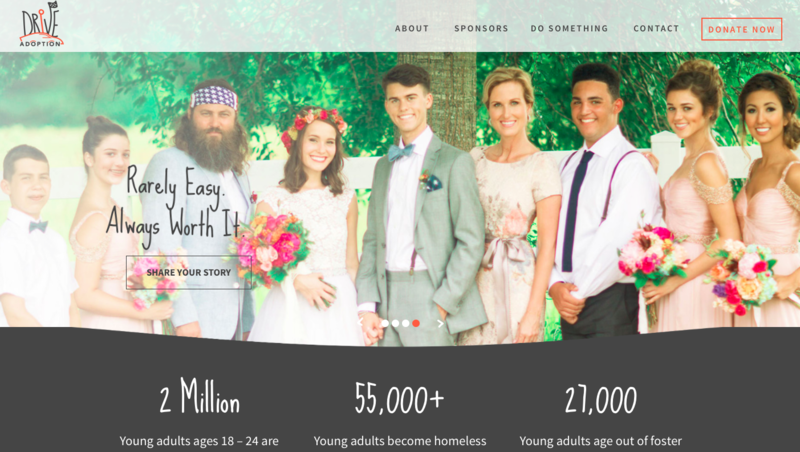 The goals of the campaign are to bring awareness to adoption through the race and celebrity of the Robertsons, and use it as a catalyst to raise funds for the cause. “We don’t want to recreate the wheel, there’s a lot of good organizations and ministries out there, we just want to raise funds for them to do what they do, and get the word out about adoption”, said Howard. The Harvard Business School recently did a study on non-profit companies, finding that a whopping 93% utilized a website as their major area to push potential customers to, being a lead in today’s fast paced and technology-rich society. Not only that, but they found that the Return on Investment (ROI) was skyrocketing for these companies, putting up a major fight against e-commerce and lead generation websites. With this friendly and interactive website, Freeform hopes to do the same for Drive Adoption. Publicity for the campaign is hitting off, soon featuring an exclusive on Good Morning America, along with pushing it through media and advertising. The campaign needed somewhere to direct everyone who was interested, so they could find out more. “Now we’ve got something to really utilize as a powerful tool,” said Howard. The site will serve as a reference point for hundreds of thousands of fans during the DC 500 on April 9th, and more along the way and after the race.